Egypt has endured political upheaval for more than five years. The Islamic State maintains a violent presence in Egypt; the militant group kidnapped and killed 21 Egyptian Christians in early 2015. And socially, Christians remain a minority in Egypt, a large community of them living in the garbage villages surrounding the capital city of Cairo. Despite these challenges, Egypt is home to the largest Christian fellowship in the Middle East and North Africa. Through the labors of Bible Society of Egypt, God’s Word is bringing spiritual vibrancy in circumstances that might otherwise appear hopeless. Through support from our financial partners, American Bible Society is grateful to link arms with our courageous brothers and sisters in Egypt, sharing the hope of God’s Word with those who need it most. Children: In Egypt, 10 percent of the population identifies as Christian while 90 percent identifies as Muslim. Christian families face a constant barrage of criticism about their faith and the message of the Bible. In this context, it is easy for Christian children to feel marginalized from their Muslim neighbors. Effective Bible ministry is needed for Egyptian children if they are to excitedly engage with the story of the Bible. Bible Distribution: Egypt is a relatively poor nation, with 25 percent of the population living below the poverty line. While online shopping is booming in the West, booksellers in Egypt still rely on brick-and-mortar bookstores to reach consumers, the majority of whom pay with cash. If God’s Word is to increase and multiply, Egyptians need bookstores that offer affordable, creative and understandable Scripture resources. Sign Language Translation: Egypt contains a large deaf community; the World Health Organization estimates that 16 percent of the population suffers from hearing loss. Despite its size, this people group suffers from poverty, unemployment, social alienation and little access to the truth of God’s Word. Christian partners in Egypt must reach the deaf community with accessible Scripture resources if the deaf are to find meaning and hope in the message of the Bible. 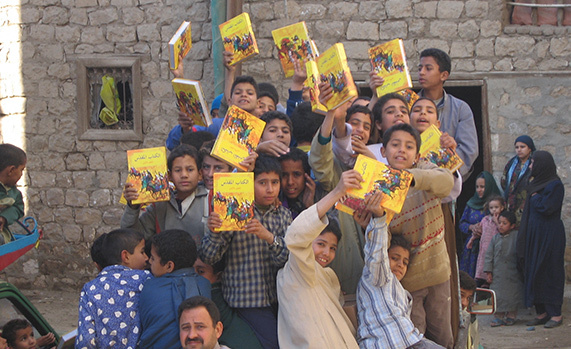 Children: Since 2005, Bible Society of Egypt, with support from American Bible Society’s financial partners, has distributed more than 800,000 free illustrated Children's Bibles to Christian students in annual school distributions across the nation. The Bible Society also reaches young children through an Arabic version of “Kingsley's Meadows,” a video series produced by American Bible Society. Biblically based stories about a lion named Kingo demonstrate the relevance of God's Word to situations that Egyptian children face every day. The program is a massive success, with thousands of children gathering at interactive “Kingo festivals” throughout the country. Through the lessons of a friendly lion, Christian children find solidarity with their brothers and sisters in Christ and encounter the love of their heavenly Father in the story of the Bible. Bible Distribution: Bible Society of Egypt runs 15 Christian bookstores throughout the country—a network that makes various Bible resources available and affordable throughout Egypt. Strategically placed across the nation, the infrastructure and personnel for each bookshop are already in place. However, the net income from sales and local fundraising is not enough to cover the operating expenses. The generous partners of American Bible Society help close that financial gap, maintaining this distribution of God's Word throughout Egypt. Sign Language Translation: With support from American Bible Society’s financial partners, Bible Society of Egypt is working to translate the New Testament into Egyptian Sign Language for the working class deaf community in Egypt. The final format, which will offer both Arabic and sign language translations, will help deaf Egyptians more easily connect with their hearing families and to become more fully integrated into their church communities. Please pray that God would continue to show Egyptian children his love through the Scripture-based Kingo festivals. Pray for the successful completion of the Egyptian Sign Language New Testament project, so that Egypt’s deaf community might encounter God’s Word in their heart language. Ask God to bless Bible Society of Egypt’s 15 Christian bookshops that make God’s Word available and affordable for Egyptians.